The New York Police Department must disclose documents and video revealing surveillance of Black Lives Matter protestors at Grand Central Terminal in 2014 and 2015, a judge has ruled. The case, brought by protester James Logue, challenged the NYPD’s denial of a Freedom of Information Law request for information on its monitoring of rallies following the police killings of Eric Garner in Staten Island and Michael Brown in Ferguson, Mo. Logue decided to file the request after suspecting that police were “compiling dossiers” on individuals at the peaceful protest, his attorney David Thompson said. The NYPD had argued that revealing its tactics would interfere with law enforcement work. But Manhattan Supreme Court Justice Manuel Mendez ruled the NYPD could not decline to comply with the law on such “overly broad” grounds. NYPD authorities “make blanket assertions and fail to particularize or distinguish their surveillance or undercover techniques and records,” Mendez wrote, adding that the department had failed to show why the use of redactions could not protect ongoing investigative work. The judge noted that the MTA and Metro-North, which also monitored the rallies, responded to Logue’s FOIL request with some paperwork. Mendez ordered the NYPD to comply with Logue’s request within 30 days. He signed the ruling last Monday, though it was made public Wednesday. The sounds of children once again fill the ground floor of the Eatmans’ brownstone on West 119th Street. This was not exactly the plan the Harlem couple had envisioned after raising four of their own children. But as the Rev. Charles Eatman Sr. knows, few things — other than the Ten Commandments — are written in stone. In December, a fire caused serious damage to the Mount Pleasant Christian Academy, which Mr. Eatman started in 1982 to provide an education that mixed religion, a sense of the world and pride in African-American culture. Without much delay after the fire, Mr. Eatman and his wife, Lorraine, took in the students, turning the ground floor of their nearby home into a makeshift schoolhouse for prekindergarten through 12th grade. Despite the tight quarters, nobody is complaining. In some ways, his insistence on not letting anything stop him, or his 25 students, dates to his childhood in Harlem and the Bronx, at schools where the curriculum was neither interesting nor challenging. He managed to go on to college, where he was so scared of being called upon by the professor that he prayed it would not happen. Despite his fears, one teacher put him at ease, and that set him on his path to becoming a public-school teacher in Queens. In the early 1980s, he became pastor of Mount Pleasant Baptist Church on the Upper West Side of Manhattan, making his after-work commute from Queens a problem. He quit his teaching job and became a full-time pastor. Then, in 1982, he persuaded the congregation to let him open a small school. He relocated the school about 12 years ago to a better space inside two brownstones on Adam Clayton Powell Jr. Boulevard. His philosophy is direct: Ground students in the basics — in both faith and scholarship — and give them a sense of their identity through classes in black history and service trips overseas to places like Benin and the Dominican Republic. In everything the school does, he said, it treats the students as individuals. That kind of philosophy appeals to Brian Adjo, whose two daughters attend the school. An accountant, he was headed to see a client a few winters ago when he met two students in the cold selling hot chocolate and cookies to raise money for a water project in Benin. He was struck by their poise. His curiosity led him to Mr. Eatman, who happened to be reading the same book about black Indians that he had just finished. Mr. Adjo was impressed. Filed under: African-American school, Harlem, Harlem brownstone, Manhattan, Mount Pleasant Baptist Church, Mount Pleasant Christian Academy, New York, Rev. 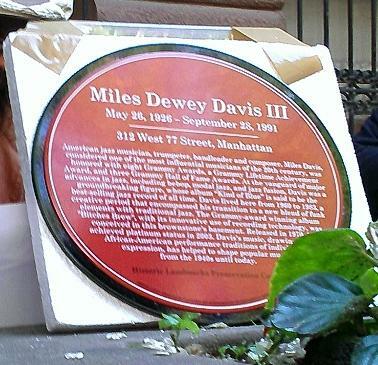 Charles Eatman Sr.
What took place was a commemoration of Miles Davis through the installation of a “cultural medallion” on the brownstone at 312 West 77 Street, Manhattan. Barbaralee Diamonstein-Spielvogel, Chairperson of the Historic Landmarks Preservation Center opened the dedication where all hands were on deck. Old friends and family spoke at the event. Author-Biographer Quincy Troupe followed reading excerpts from his works describing Miles. Next up was composer/ arranger son of Jimmy Heath, Mtume, who expressed his experiences with the “genius.” Others who spoke were Lee Konitz, Gary Bartz, Wallace Roney, Phil Schaap, George Coleman and Miles’ nephew from Los Angeles drummer Vince Wilburn, Jr. Also present were Bill Saxton owner of Harlem’s Bill’s Place, Noah Evans son of arranger Gil Evans, Juini Booth bassist for Thelonious Monk and SunRa plus Sandra Trim-DaCosta (former Director of Marketing, Columbia Records/SONY Music) who worked closely with Miles for several years, after being assigned by the late legendary music industry executive Dr. George Butler (former Sr. Vice President, A&R, Columbia Records) to develop the overall marketing campaign for Miles and his recordings for the label … Dr. Butler played a significant role in the jazz icon’s return to the music scene and we are forever grateful to him for his tenacity and vision for Miles. Usher will collaborate with Macy’s to curate the concept, music and design for the Macy’s 4th of July fireworks show, which will be launched from barges off Manhattan. It’s the first time the company has worked with an artist on the concept for its annual show, Macy’s said Thursday. Usher will score the music for “It Begins With a Spark,” which will feature his songs, as well as songs from Rihanna, Swedish House Mafia, Jimi Hendrix and Frank Sinatra. He will also provide visual design cues and direction for the pyrotechnics that are choreographed to the musical score. The 37th annual Macy’s 4th of July Fireworks display will air after the annual concert on NBC.